2011 is the year. I'm going to catch some gar on a fly rod. Been meaning to go after these dudes for awhile, but just never seem to get around to it, what with the great carp fishing around here and all. Anyway, as luck would have it, I got an email from Rob Prytula not too long ago. (Yeah, you've seen him before - click here.) 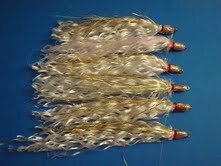 Ol' Rob is a pretty dang good fly tier and has turned his considerable talents to gar flies. Yep, you read that right - gar flies. Cool thing about these flies is that they don't have hooks. 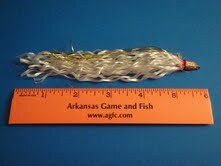 Gar have hard bony mouths that resist a hook, so you use these long, stringy hookless flies. When the gar eats the fly and chomps around a bit, the strands get caught in it's teeth. 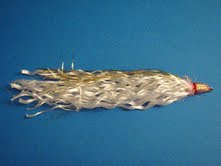 There is no hook-set in this deal, just give the gar time to chew on the fly a bit, then slowly draw tight to the fly. When the fish figures out that something ain't quite right, well, things can get real interesting. These things go absolutely beserk. That's Rob in the photo below with a beauty. And yes, wear some gloves. Gar got a mouthful of teeth and can draw blood. I've caught lots if gar on the fly rod. I've used poppers, deceivers, and even the good ol' woolly bugger. They can be hooked, but removing the hook is often tricky. I'm not saying they're easy to hook, you miss more than you actually hook. The north MS reservoir spillways are so full of them that it is non-stop action. I've caught a couple below Burgess Falls closer to your neck of the woods. I've been wanting to tie and try some of the rope flies, but just haven't gotten around to it. I think this year I will for sure. Well dang, Jay. I'm jealous. I've hooked a few over the years but they always come unbuttoned. Usually right at the boat. I figure the rope fly will keep them on the line so I can close the deal. Ive caught 1 on the rope-fly. Kinda cool. The only problem was that I didnt know what the heck to do to get the fly out! That mouth of teeth is intimidating to say the least. Good piece of writing I have to admit. Well penned and helpful, many thanks! Great piece of reading I must say. Well written and extremely useful, many thanks! Seriously, this was indeed necessary to me personally. I'm a newer article writer. Bless you so much! Thank you very much. Appreciate the comments. those are some sweet looking flies!! Great blog! I just started following!